About 1.5 hours from Todos Santos, daily pangas leave for Espiritu Santo. 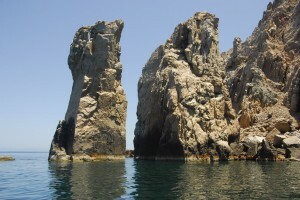 The island is a must see, located almost directly in front of the city of La Paz. Its entire area has been designated as National Park, therefore no one lives on the island aside for a small group of fishermen. A tour of the island (from approximately 10 am to 4 pm) will take you around the entire perimeter (including Isla la Partida) giving you the opportunity to discover the small hidden gems of beaches with emerald and sapphire waters and enjoy the rich marine life that surrounds the island. Waterskiing and snorkeling available. Don’t miss swimming with the seals when you visit their colony and don’t be surprised when one looks directly into your mask. Lunch is usually included and served on one of the many beautiful beaches. Wear sunscreen! 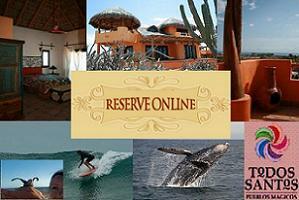 We feel Azul Tours provides one of the best services. To reserve your panga call 612-125-2596 or visit www.azultourslapaz.com. To get there, take Hwy 19 Northwhich will merge into Hwy 1 North to La Paz (bear left at the intersection). Shortly after passing the bridge over the large arroyo make a right towards Pichilingue. Go straight at the stop sign for about 15 minutes. At the T on the road as you reach the Sea of Cortez make a right (try to remember a landmark here as you come back this way there are no signs at this intersection). Follow the coast to the end of the road where a crowded beach with bar and restaurant is located. This is Playa El Tecolote where the pangas depart. Optional — on your way back stop at Playa de La Balandra if you have the time. Leave your car in the parking area and walk to the beach follow the coast to the right (with high tide you may have to get your feet wet, but it will be worth it). The beach is phenomenal and you’ll be able to see the famous mushroom rock here (El Hongo). [flickr album=72157618328420375 num=5 size=Thumbnail] For slideshow, click here.